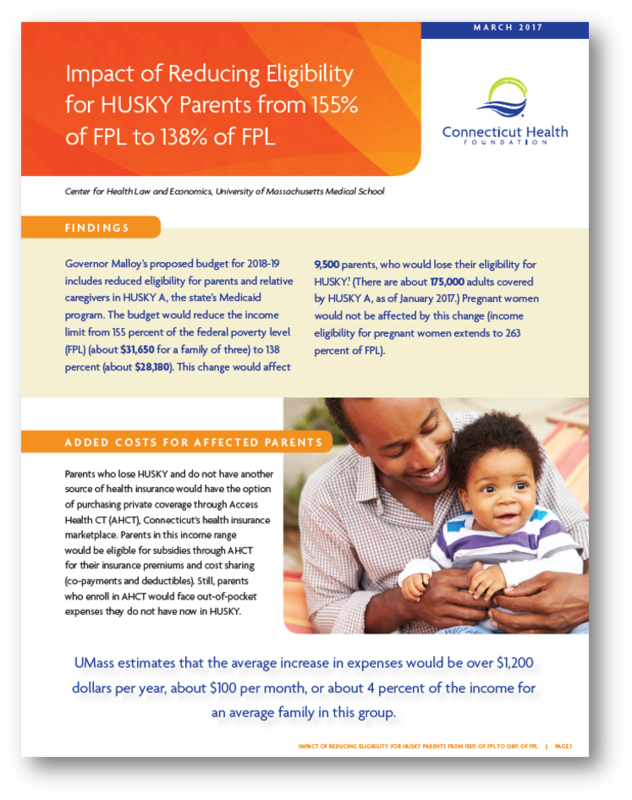 HARTFORD, CT (March 1, 2017) – The Connecticut Health Foundation (CT Health) announced the release of a policy brief today that discusses the potential impact of cuts to HUSKY A eligibility that are being proposed in Governor Malloy’s 2018-19 budget. These cuts affect the health coverage for parents of children enrolled in HUSKY A, the state’s Medicaid program, by reducing the income limit from 155 percent of the federal poverty level (FPL) (about $31,650 for a family of three) to 138 percent (about $28,180). This change in eligibility would impact 9,500 parents, who would lose their coverage through HUSKY and instead need to purchase federally subsidized insurance through Access Health CT, Connecticut’s insurance marketplace. While the Governor’s proposal suggests that these parents can find affordable coverage by purchasing through the health insurance marketplace, UMass estimates that the average increase in expenses would be over $1,200 dollars per year, about $100 per month, or about 4 percent of the income for an average family in this group. “As we saw last year with the eligibility cut in Medicaid, it is easy to say that caregivers can get coverage through Access Health CT, but for that population, even with subsidies, they cannot afford the cost. This proposed cut in eligibility affects those with even lower incomes so their ability to pay is further diminished,” said Patricia Baker, President and CEO of CT Health. The brief was commissioned by CT Health and conducted by the University of Massachusetts Medical School Center for Health Law and Economics. A full copy of the brief can be found here. In 2013, CT Health announced a five-year strategic plan that made expanding health equity the foundation’s central focus. For CT Health, health equity means helping more people gain access to better care, especially people of color and underserved populations. Better care includes physical, mental, and oral health. For more information about the foundation, please visit www.cthealth.org or 860.724.1580.